I am one of those lucky girls who has the "World's Greatest Sister" for MY sister. I do only have one sister to chose from but she would win anyway. My sister Emily is 6 years older than me. Some of my first memories are being propped up on her hip while she toted me around like I was her own life sized baby doll. I stayed close by her side long after I had outgrown her ability to carry me. She was my stylist, my beautician, my counselor. Although most are, not all memories are fond ones. I remember her french braiding my hair with such force that once the braid was completed I needed pain meds. She could braid the worlds tightest braid. It would withstand even the most active recess or gymnastics lesson. Growing up I looked up to her. She was always very interested in what I was doing, who I was liking and what the latest elementary school stories. I wanted to impress her. This continued until she went to high school. Then things were different. You see, she was a cheerleader and she had other things-or boys-on her mind. Luckily high school is only 4 years and we quickly picked up where we left off. Haha. Most significant moments in my life Emily has had a hand in: hair stylist for Prom, wedding planner to help with all the decisions I was clueless on "What are my wedding colors? uhhhh...... what do you think Em?" even down to helping me through my deliveries with my babies. She's the real deal. Everyone wants to be Emily's friend. She's gorgeous, funny, smart, sweet, talented...If she wasn't so kind some would hate her for all these traits. How does one woman keep it all together with such ease? It's a mystery to me as I trounce around in my sweats and disheveled hair and she's got a darling outfit on, great hair and wedges! We both grew up, got married, had kids. She has 5, I have 2. And both got involved with teaching Zumba. With our crazy lives as moms and wives with family and church responsibilities this became something we could enjoy together as adults and keep us connected. I became and instructor in 2008 and after a few years of probing I convinced her to take the plunge. I became involved with a more corporate side of the business and with my schedule and the traveling I do I needed a permanent substitute. Emily was such a great supporter. She was there in class everyday and knew all my routines. She was just the gal I needed. She did more than just "sub" she shines! She makes every student feel special and appreciated and she has really excelled as an instructor. It's been so fun to have someone to share the craziness with. 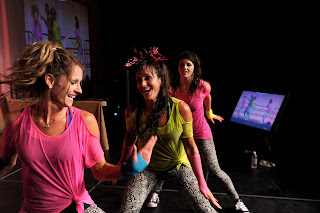 We talk Zumbawear, songs, choreography, and a whole slew of things only Zumba fans would understand or be interested in. She even assists me at the Zumba Instructor Convention. She is the best supporter. She has been nothing but happy and encouraging to me. What would I do without her? When I was in Pennsylvania for QVC and a Zumba event in New Jersey that same weekend. I was feeling really home sick. She must have had some sort of sister intuition because this is the text I received out of the blue. "We have each other :-) isnt that great? :-) xoxo"
I responded. "In life?" to which she answered. "Yep". So I said, "Oh that made me teary. I love you!!!!!. What made you say that?" then she said. "Just felt it. and wanted to pass it on. :-) Love you." In life if I had a wish for every girl (besides having a great marriage :D) it would be that they get a sister. Not just any sister but a GREAT sister. One who lifts you up, makes you laugh hard, lets you cry a lot, knows you for who you are, that best friend kind of sister. I have THAT sister and what a difference it has made. Em...my sister...love you bigger than the sky. Pics: presenting at Zumba Instructor Convention "Dancin Thru the Decades" class, just me and my sis, Daddy's girls. I loved reading this, it reminds me how lucky I am to have sisters. I have 5 older sisters, but one in particular is my 2nd best friend ever. We're separated by hundreds of miles but we talk ALL the time, even cook and clean "together" while we chat for hours on the phone! We're so lucky to have such wonderful sisters!